As if the USA prisons are not overcrowded already, they want Gary McKinnon, a hacker with Asperger syndrome (autism with high functioning) to come over and join in. Gary McKinnon risks to spend 60-70 years in an American jail. That is because the British government agreed to extradite the man instead of giving him a trial in the UK. McKinnon's idea with hacking government computers in 2001 and 2002 was to prove that the USA knows about UFO's, he says. But he also left a threat...See Wikipedia about the case (link below). McKinnon is of course a man with a mental handicap and not everybody born on his day (February 10, 1966) is about to be sent overseas. But still, I was curious about what is in the chart of that day that is reflecting (part of) the possibility or explanation of the events and the act itself? Here is the chart for time unknown (12 noon). Neptune rises before the Sun and is square the Sun. If any aspect refers to isolation and fantasy, it is this one. Notice the square between Saturn and Uranus, in hard aspect with Pluto. It is a generational aspect. Some of those born in that generation will be subject to political (Pluto) restrictions of freedom (Saturn-Uranus). Only a few will experience the hard effect of the combination...when for example this combination is linked to the chart's angles. In 2001/2002 - when he committed the crime - transit Uranus was conjunct his Sun. In the natal chart the Sun is inconjunct Uranus (more if he was born earlier). He has Sun trine Jupiter and square Neptune. Not so long ago transit Neptune was conjunct his natal Sun (last year, when the first protests against his extradiction started). Jupiter will soon be conjunct his Sun. Although Jupiter is usually a fortunate symbol, in this case it might also mean that he will travel or go far (to the USA...). Jupiter symbolizes prosperity, growth, the judge or doctor, judgement and help, travelling, the international and more. Daryl Johnston was born on the same day (in the USA). He is a successful football fullback and known for his contributions to charity. Yes, that is another way to express an oriental Neptune (idealism) and a 'calling' (unaspected) Mars (drive, energy) and another way to have support(ers). Johnston works as a color commentator right now and that is perfectly mirroring the Sun, Mercury, Jupiter and Neptune combination for using a lot of words in the media:). So...you don't need to try to get into government computers just because you were born this day. But there is a great chance that you will have a special drive and will get a lot of support in a specific period in life. For UK citizens who want to try to help Gary McKinnon to remain in the UK: see this site...http://freegary.org.uk/ A petition hasn't helped much so far. Not surprising and happy result for astrology: Van Rompuy is the 'President'(in fact chairman) of the European Union with transit Jupiter - the planet of successes - conjunct progressed Midheaven. Dutch MP Balkenende (who was named even though he kept saying that he was not a candidate and nobody asked him to be one) had transit Saturn inconjunct Midheaven. So now we now for sure that it is better to have Jupiter on your side than Saturn on a slide. The posts about Van Rompuy and Balkenende can be found easily. Just type their names in the upper left corner of my blog. Above is the time unknown chart of Domenech, who seems to know about sun signs, but not about transits. He once said that he was certain to win, but he lost (with transit Saturn inconjunct Sun - a signal for defeat -). Now he has transit Pluto square progressed Sun adn progressed Sun inconjunct Mars. In the natal chart Sun is quindecile (165( Pluto and square Mars, with Mars quintile Pluto. That is a strong combination for a coach and shows a strong and creative drive to win, as you may read on my site Astromarkt. This natal combination is now being activated and highlighted, including a slight danger to get angry or driven too much (with possible health problems as a result). And it seems that his team won anyway (and France will go to South Africa next year), because I just read that the Fifa won't have the match replayed. It is the referee who decides, not the Fifa, they say. See the Guardian, with the 'hands' and Raymond Domenech in the video. Look at Mars in Aries, leading the bowl in her chart, and watch the position of the angular Moon in Gemini, Jupiter (the international) rising before the Sun, Venus (on Sun/Moon) in the ninth house and Neptune on top and you see a person who loves to be an international and travel around and who has fans and followers, too. Astrologers: do the witch test! I was notified about the hour of birth of Herman van Rompuy on Astrodatabank and here is the chart. Transit Jupiter is now square his progressed Midheaven. That transit looks so much better than the inconjunction of Saturn that is 'helping' MP Balkenende of The Netherlands to become the first European President! So Van Rompuy has better chances, at least today and this week. His social goals are being supported. I have written about Van Rompuy before and I noticed the prominence of Neptune. In the chart with hour of birth, Neptune is even more prominent. That means that it is to see ideals, ideology, religion and ...art rise above all. It was my second Saturn return, a sort of a second birthday, yesterday, at 17:30 MET. With the solar return we use to celebrate our birthday, every year. When Saturn returns to his position at birth we usually don't eat cake or get presents and nobody is congratulating us. Maybe that is because we consider Saturn to be the symbol of old age, maturity, responsibility and restrictions. Still, it is Christmas time and New Years' day in Capricorn time and Saturn is supposed to dispose of Capricorn. 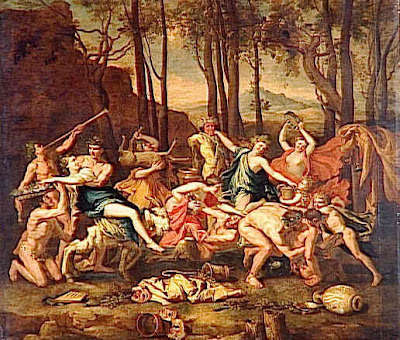 The Roman Saturnalia were big parties in honour of Saturn! So I thought that it is time to have another look at my Saturn return and see the good side of getting older, ending a period of about 30 years and knowing that you are entering another lifetime: old age:). What is the benefit of it? Saturn's return might tell me now that it is far too late to ...you name it. Saturn's return comes with considerations about the final years before stepping back and starting to be without a job and without perspectives (well, unless you are a Chinese politician, an English queen or a wise old witch). It is over, dear! You entered the so called 55+ zone and you are about to be launched to the next room. Don't look now, because it is rather depressing. It is the FINAL room. Saturn's return makes you aware of time and age. Time to consolidate, count your blessings and face reality. Saturn is helping you through a period of change. At age 30 you were not young and funny any more, but mature and facing a career to be made or the obligations of parenthood. At age 60, however, you are not even mature any more. You are a senior and facing the obligation to stop your career, be wise and have everything under control (freezer filled, house waterproof, money in the bank, you might need it later). Time to stop, look around and see what needs to be done next. A moment of considerations. Prince Charles will be 61 on the 14th of November. Now that I write this it is already November 14 in London, so: happy birthday to him! I have written about Prince Charles before. Click here to see posts about him, his chart, relations and more...And if you are interested in his artistic talents, see the post on my site Art&Astrology. And there is a post about Prince Charles and Camilla on Astrology-love-romance.blogspot.com. 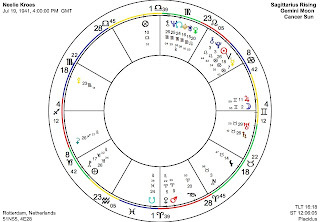 Below you see Charles' solar return chart (his birthday chart). It is a rather fortunate solar return chart at first sight, with the Sun on the horizon and Jupiter on top. Jupiter rules the 8th house of life and death, however. The Northern Node on Midheaven might mean that family matters more than ever...There is also a conjunction of the progressed Sun and transitting Node on his birthday, highlighting the group , company, family and nation. Next year we will know what was the meaning of this solar return, but we might do some guessing. There is an aspect between Moon and Midheaven, so it is a year of changes. 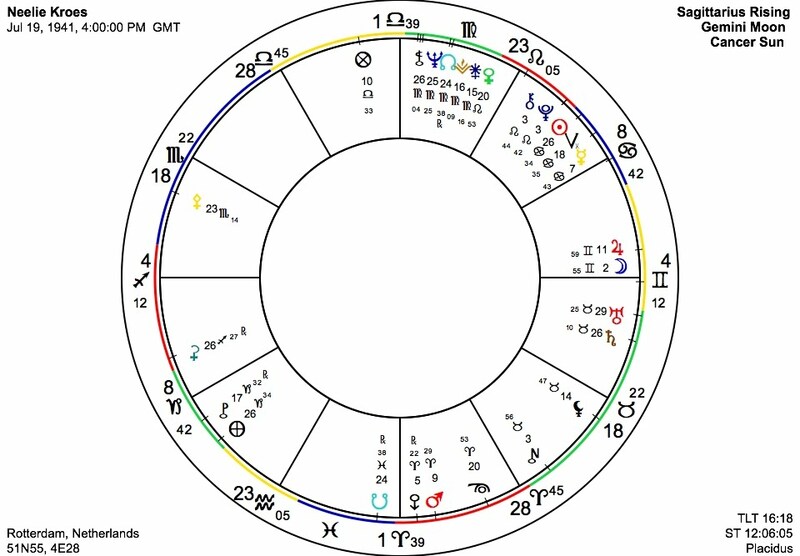 It's that we know that his mother will not step back in favour of her son, but it looks like the solar return chart for a king to be*). It is the same combination as in the natal chart of his eldest son William, who has Sun conjunct Descendant and Jupiter conjunct Midheaven. 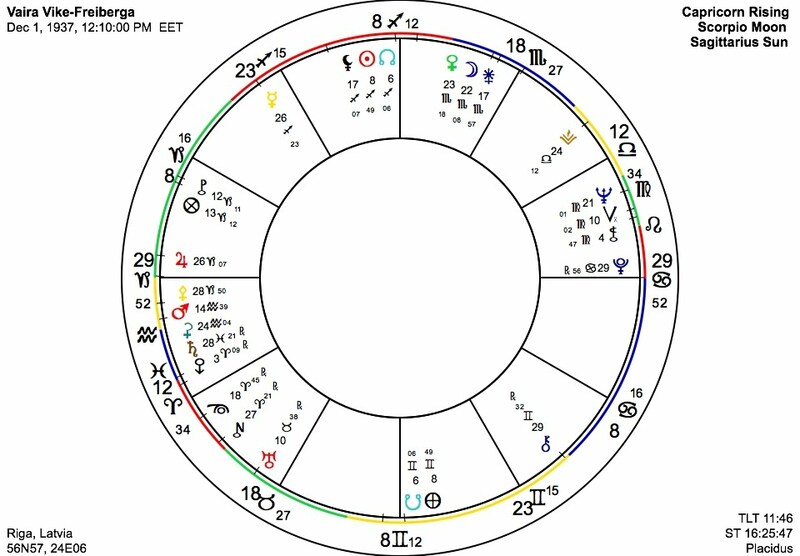 In 2010 Prince William's progressed Midheaven (progression .98 degree/year) is changing sign and the first aspect will be an inconjunction with the ruler of the 8th house, the Sun. It might mean that he will be taken aback by a change in status. I doubt that he will become a father, so it might be another kind of family matter (houses 4/10 and 8). It might be an important year coming for Charles, anyway, with opportunities to grow, travel and convince the public. I'll be back next year (I hope) to see how the events matched the solar return ....or not. Scorpio Charles will move on in 2010, somehow. *) The progressed chart of his mother Queen Elisabeth has a Yod of the Ascendant inconjunct Saturn ruler 8 and Mars inconjunct Saturn, with Mars sextile Ascendant. The Yod is pointing at Saturn, and Saturn is conjunct Midheaven in her natal chart. The combination of AC/Mars/Saturn often is reflecting a situation of restricted energy or a blockade (the end of energy, work, mourning, death etc. ).She might be less energetic in 2010 than she usually is and will have to take good care of herself and her husband with whom she celebrated a 60 years marriage in 2007. See the post of that day... Maybe that is why Charles will get more chances to show up in official occasions in 2010. This period of conspiracy theories will be over soon enough. The Winter Solstice will bring a conjunction of Jupiter and Neptune in Aquarius: new hope is coming up! For more about Saturn and Pluto or Jupiter and Neptune, click the labels below (only on Astropost.blogspot.com). Khalid Sheikh Mohammed probably was the leading figure of September 11. He is in New York now, facing the judge. There are two possible days of birth given. Both days have strong Mars-Uranus influences. Yes, I thought that it might be easy to find the terrorist and the correct date of birth by looking at the positions of Mars and Uranus. You know that there are many examples of ‘ freedom fighters’ and ‘ terrorist’ with a prominent Mars-Uranus in their chart (see my site Astromarkt about the effect of Mars-Uranus with various examples). Piece of cake? No! I found that both dates of birth (March 1, 1964 and April 14, 1965) might fit! Perhaps one of the named days is his birthday and the other one is the day of birth of a co-fighter? - The Sun opposition Pluto is the reflection of making life difficult for yourself and others because of fanatism and: of wanting to be an authority. Correct. However, he was captured on March 1, 2003, in the year of progressed Sun conjunct Jupiter! Unless I should read this as the journey of his life (going across the ocean) - and wouldn't that be a rather cynical effect of Jupiter - this can't be his chart, I thought. - Mars opposition Saturn (orb 4 degrees; the issue of death and of taking hard measures). - The midpoint Mars/Uranus is sesquisquare the natal Sun, a confirmation of the possible rebellion. - Finally: Jupiter is ‘ calling’ (and didn’t he have international connections? Since 1999 KSM was a leading militant. The Aries KSM had progressed Sun trine Mars in 1999 (a perfect reflection of a leader in a war). The Pisces KSM would have progressed Sun semi square Mercury in those days. And perhaps that was significant for his lifestyle in those days, who knows. Perhaps one of the days of birth belong to KSM and the other to one of his mates? Could one of these days be his date of birth, in spite of the seesaw pattern that should implicate the person able to compromise and in spite of the Libra Moon (though they could have been born at night, having a Moon in Virgo of course)? If one of the birthdays is his, than apparently seesaw patterns and Libra Moons don’t have the same strong effect as a strong hard aspect between Mars and Uranus has. I calculated these charts for birth in Kuwait at Sunrise. Remember that place and time of birth are unknown. The displayed Ascendant and Midheaven and degree of the Moon are fictious! The United Nations announced that July 18 will be ‘ Nelson Mandela’ day from now on. The 18th of July is his birthday. Uranus is a very important planet, too, as you may read in ‘ The theme of freedom’. 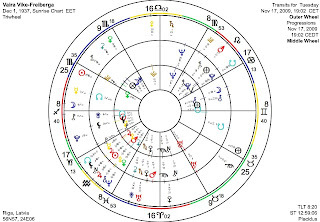 The announcement of Nelson Mandela-day comes with transits of the prominent Uranus with the prominent Venus (square) and with the vital midpoint Sun/Moon (opposition). Having a day named after you is of course the ultimate pleasant (Venus) surprise (Uranus) and very motivating (Sun/Moon)! Another reflection of his popularity is the position of Jupiter, ruler 1, in the seventh house. That increases the number of partners and the general idea that it is a pleasure to have company. He is very good at networking (Venus and Jupiter in the seventh house)! Nelson Mandela is also a legendary person. Perhaps that is why we see the MC semi square Neptune/Pluto and the natal Sun between Neptune and Pluto. Neptune is parallel with Pluto. Neptune and Pluto are the combination of the secret or hidden force (and they have been hiding him for 27 years...). It is also a combination of discretion, related to the social position. 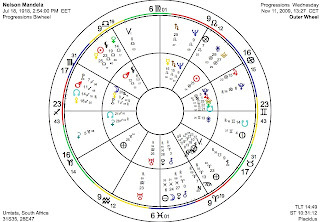 I have written about Mandela and his chart before in a post with the natal chart and transits of the day of his conviction, when he had Saturn opposition Midheaven and Uranus conjunct Midheaven. The combination of Saturn and Uranus is the combination of restricted freedom and of breaking free; in other words Saturn-Uranus is reflecting the theme of limited independence. The issue of Saturn and Uranus came back on February 11, 1990, the day of his regained freedom. Progressed Ascendant conjunct Uranus and opposition Saturn reflected the moment of ‘ breaking free’ . Progressed Saturn was trine his natal Ascendant. In the summer of 1994 he got the Presidential Medal of Freedom. Progressed Midheaven was square Saturn and Uranus! Why are Saturn and Uranus so important in transits and progressions? Maybe it is because Uranus is important. Uranus is the focal planet in the funnel shape chart and is placed in the third house, ruling the third house of communicatons and in a very telling inconjunction with the Sun: he lost (inconjunction) part of his life and freedom in a rather disproportionate and contradictional way: in order to be free. Sun inconjunct Uranus is also showing that he is unconventional and subject to controversies. The midpoint Saturn/Uranus is in hard aspect with Moon (opposition, it is a midpoint Yod) and with Pluto. Moon is sesquisquare Pluto. Moon is in mutual reception with Pluto. Pluto is the planet rising before the Sun. He experienced imprisonment, stress and pressure, but he had a strong enough personality to be able to resist, survive and come back to be a President. The Sun is placed on the midpoint Saturn/Pluto, mirroring the ‘ die hard’ . (More about die hards and Saturn/Pluto on Astromarkt). It is a strange chart for a President and for a man with a day named after him. Mercury ruler MC is conjunct Saturn and parallel Saturn. Saturn is the planet of the administration, ambition, classical studies and management. Pluto is sextile Midheaven, making the strongest Ptolemaic aspect. The combination of Mercury, Saturn and Pluto is the combination of knowing what NOT to say (strategic thinking) that is so often seen in the charts of politicians, like those of the American presidents in the study on Astromarkt. But I would have like to see a stronger statement in the chart of Mandela. This chart is reflecting a beloved politician with a ‘ mystic ‘ reputation. Jupiter ruler 1 conjunct Pluto (the planet of orientation), are both rising before the Sun. Jupiter is semi square the ruler of Midheaven and sextile Midheaven, just like Pluto is. 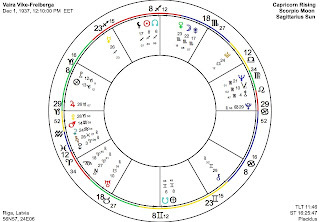 Once you know that this is the chart of a person with a day named after him, you see the combination of successes rising before his natal sun and related to the MC, the Ascendant (by rulership) and the ruler of Midheaven. The charts angels are related to Jupiter and Pluto and they are related to Midheaven. Maybe that is the key to his success. The source for the hour of birth is 'Vocations' by Noel Tyl (recommend book, by the way:)! Jennifer Lopez has bad luck with ex-husbands and former friends. She even had to ask the judge to forbid her ex Ojani Noa to publish strictly private material. But the most dramatic reflection of problems is the transit of Pluto in the second degree of Capricorn, exactly inconjunct her natal Leo Sun. It shows how something has come back from the past (Pluto), challenging her and confronting her and that it is shaking her world (inconjunct Sun). The inconjunction sometimes has an unbalancing effect (see more about inconjunctions here…), you are sort of ‘taken aback’. Today the USA House of Representatives passed the Health Care Bill. The Congress agreed with President Obama's health care plan. The Senate still has to agree, too (and that might be a difficult process), but: it must be a moment of joy for the President and his crew. His chart shows that moment. Let me tell you a little more about the progressions, transits and natal chart of Natascha Kampusch, following the message about the arrest of the friend of Priklopil, her abductor. The progressed (secondary) Ascendand and Midheaven have now reached the first degree of Aries, symbolizing the fresh new start and the public attention. They have recently been square Saturn and Uranus (the combination of limited freedom and breaking free). The conjunction of Saturn and Uranus is very important. They sort of stand alone in the first degree of a sign, not making major aspects within sign and within 5 degrees. The issue of restricted independence is 'calling'! and right now it is in a crucial stade. Transit Saturn square Saturn, Uranus, progressed Ascendant and progressed Midheaven is telling us that it is not easy for her and perhaps scary. But, there is help on the way. Notice that transit Jupiter is close to the natal Ascendant. Often in times of trouble, Jupiter is reflecting the helper, the doctor, support in general and the start of a better conditions (of health, the domestic situation or mental progress). In the posts about the case I (maybe) never mentioned the amount of sextiles and trines in her chart. That is similar with the charts of many inmates and I use to think that it refers to 'the easy way out' and lack of resistance against viruses and wrong influences. There is a tendency to give up or take life as it comes. It maybe explains why it took her so long to escape out of the hands of Priklopil. More about the effect of the sextile in an earlier post (click here). Later I found more examples of the effect of the sextile (link). Here you see the charts of the moment when the shooting in Fort Hood, Texas started (above, with the natal positions of the shooter on the outside of the circle) and separately the chart with the natal positions of the shooter, Nidal Malik Hasan (below). Just like in the case of the incident on Queen's day (April 30 this year), Saturn had an important role in the chart of the man who caused the tragedy. -Transit Saturn was opposition the natal Sun of the man who ran his car into the public (on purpose) and it is known now that he planned his suicide and was depressed. He had payed the rent for the last time and had no house after April 30. 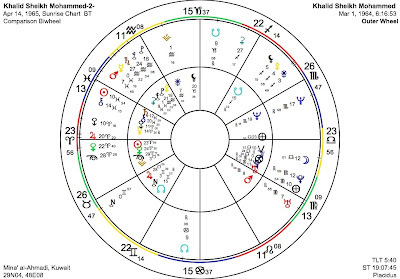 - Nidal Malik Hasan has the progressed Sun inconjunct natal and progressed Saturn this year. That is an astrological statement for being out of balance due to a depression and for making a mistake with an important 'lost'. He had cleaned his appartment and given away his Koran. But it was not just a depression, because at the same time he had transit Pluto trine Mars and progressed Mars conjunct Pluto, the comnbination for an act of violence and getting hurt. 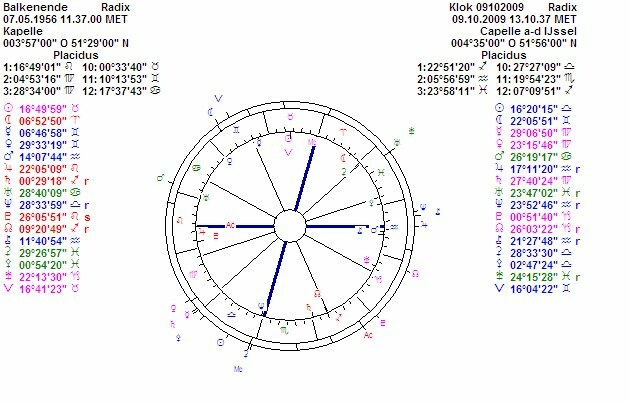 At the moment of the incident in Fort Hood the important Mars of the shooter had just been square the local Midheaven and his Pluto was exactly 67.5 degrees from Midheaven (that is a semi square and a half semi square). Mars is very important in the chart of Nidal Malik Hasan. The planet of war and aggression is oriental (= rising before the sun). That is often so in the charts of soldiers, activists and people who act first, think later (or in other words: want to MAKE a statement). The tightest aspect on the day of birth of the shooter is Mercury conjunct Pluto. That aspect is reflecting very strong opinions and possibly stressed ideas. Mercury is trine Saturn (and that is good for scientific studies), so that there is a combination in favor of the strategic (political) mind. This combination is sort of repeated in the combination of Sun in Virgo (ruled by Mercury) and Moon in Scorpio (ruled by Pluto). Another strong aspect is Saturn sesquisquare Uranus. It is the aspect combination of restricted freedom and trying to break free. The combination is often found in the charts of people who had to give up part of their independence. Click the label below this post on Astropost.blogspot.com to see more examples. According to the wish of the unaspected Sun he has now drawn attention and been in the center of it, but (inconjunction): the bad way. It caused the lives and health of many. Perhaps his individual chart with hour of birth explains more. The day of birth just shows us the possible effect of a depression in the life of a man who is able to shoot and kill. On the day of his birth, September 6, 1970, there was a mix of ingredients that (in certain circumstances) could create an incident such as in Fort Hood. He had the drive (Mars), the strong determined mind (Mercury and Pluto) and he wanted to give up on the status quo (Sun inconjunct Saturn). Unfortunately he had access to the 'cop killer gun', the Belgian .N. 5.7 mm Herstal. American soldiers can buy them without any problem. There are even rumours that the shooter was a fundamentalist and his white traditinal clothes on the final day suggest that this might be true. He was very devout and it is said that he couldn't find a matching spous because he had too many conditions. He even refused to be on a picture with women (and now he has been shot down by a police woman, Kimberley Munley...) Maybe that is another effect of the inconjunction. So now there is another name on everybody's lips: Herman van Rompuy. He is a Belgian politician and no one is against his candidacy. Here is his chart. 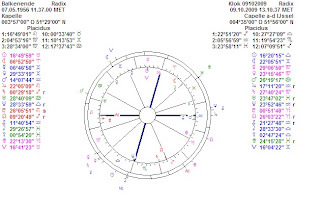 There are no important transits and progressions at first sight, but as it is a chart without hour of birth, the Midheaven position might change everything. 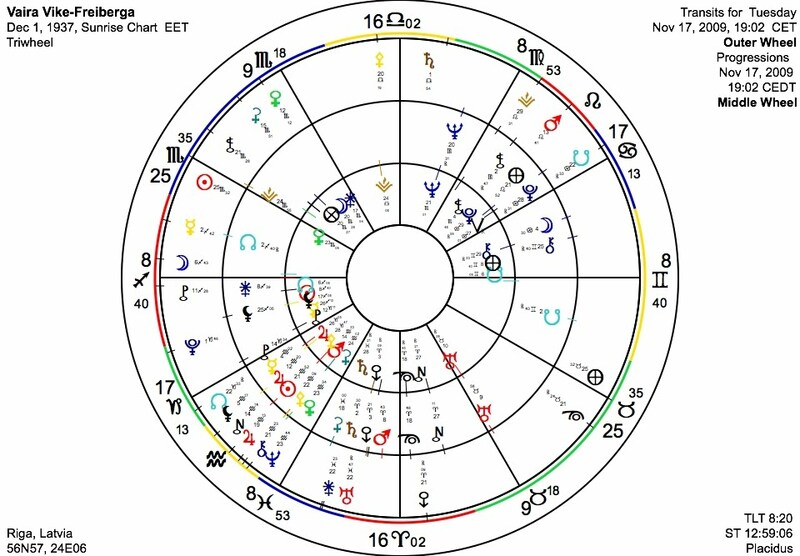 What you see is the chart of a leader (the Sun without major aspects in sign or orb 5 degrees), who wants to make changes (Uranus 'calling' too). In September 2007 I wrote about his chart because of his involvement in the formation of the Belgian government. He is a conservative with a 'calling' Neptune rising before the Sun. Neptune is the symbol of ideology and religion. But it is also a prominent planet in the charts of artists. Herman van Rompuy makes 'haiku's' (Venus semi square Mars/Jupiter and Jupiter/Pluto is reflecting successes and ...a lot of support). There are many positions in fixed signs (for a strong will). Mars is conjunct Pluto and sesquisquare Aries Point, mirroring the use of power, and political struggle. In 2007 he had a progressed trine between Jupiter and Pluto. Venus in Scorpio explains his second study: economics. If he becomes the European chairman and if I get to know his hour of birth, I'll be back on this chart.